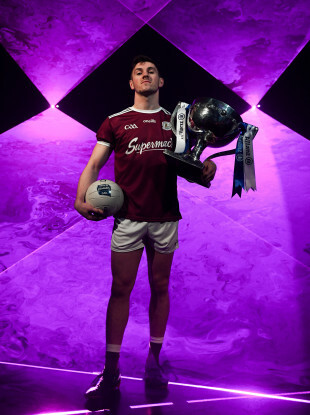 Galway forward Shane Walsh reflects on Galway’s 2018 campaign and looks ahead to the new season. Shane Walsh was speaking at the Allianz Football League 2019 launch. 2018 MUST BE considered a major success for the Galway footballers. They topped Division 1 after going unbeaten in the spring, running Dublin to four points in the final. The Connacht title was regained in June, while they took the scalp of old rivals Mayo along the way. And a Super 8s victory over Kerry in the Croke Park rain seemed to confirm Galway’s status as legitimate All-Ireland contenders. Their final game in the quarter-final phase came against Monaghan, with Kevin Walsh’s side already guaranteed a place in the All-Ireland semi-final for the first time since 2001. A draw would have sealed top spot and a showdown with Tyrone for a place in the final. But the Farney handed out an eight-point beating to the hosts in Pearse Stadium, and Galway’s spark seemed to go out that evening. A week later, Shane Walsh’s injury-time goal was just a consolation as Dublin powered to a 1-24 to 2-12 last four victory. A season that promised much ended in a whimper. “It’s a funny one, because you are building yourself up for the Monaghan game,” says Walsh. “But at the back of your mind, there is that factor that you have qualified out of the group already. We were in an All-Ireland semi-final which this Galway team have never been in before. “I think that’s something for us to learn this year going forward. That whatever game is in front of us we have to go out and win no matter what. We’re not like the Dubs of the world where we’ve been winning All-Irelands and we can take a game for granted. “We can’t do that. We can’t afford to. I’m not saying we did either, it’s just, I think, in the back of your minds when you have that sub-consciously there it does make it that bit harder so when it’s there for the taking you’re probably holding back instead of going for it. “For us, the young lads are there saying, ‘We’re in an All-Ireland semi-final, it’s great.’ Even myself, I’ve been around the panel six or seven years and I was thinking it was great to be in an All-Ireland semi-final. The next thing Monaghan came along and clipped our wings. There was a school of thought at the time that Walsh should have rested his big guns for the showdown with Dublin the following weekend. Jim Gavin, in comparison, largely played his second-string against Roscommon and they looked far fresher in the semi-final. But there’s not a whole lot Galway can do about it now. Walsh assures us that Galway will take the league seriously once again, rather than holding their fire for later in the season. “We wouldn’t find ourselves lucky enough to be doing that. The likes of Dublin can probably afford to with the strength of the panel they have, but for us we know we’re only as good as our last game. “The league last year went very well for us. A couple results that went our way, we won by a point or two. They could have gone the opposite way as well. So we just have to be on our guard again. All things going well, win a couple of games, you have a chance to blood players through. Inter-county footballers find themselves in a peculiar position this week. Nobody knows what rules the Allianz Football League will be played under just yet, with Central Council set to make a call on the experimental rule changes this Saturday. “It’s the last thing from our minds, it’s all about trying to prepare ourselves as best we can. If the rules come in the rules come in. As I said, for us, if we can get the ball from ‘A’ to ‘C’ by skipping ‘B’, that’s the aim of the game. “The game has evolved so much, the pace, physical strength is a huge part of the game now. We’ll be looking to exploit that from the youth that we have in the squad. “Everything has been put in place for us and whatever rules are there we’ll play with them as we go along. “I have no experience of the new rules at all. I was in Tuam Stadium along with about 6,000 Mayo people and was uncomfortable until the end, when it was a nice place to be. “To be honest, I think a lot more can be made of it. Football is football, at the end of the day. You go out and play it and with this handpassing people are automatically counting numbers and this sort of thing whereas instead of just simplifying it. The inter-county famine is about to end, giving way to a nine-week feast of Allianz Football League action between the weekend after next and the four divisional finals in Croke Park on March 30/31. The exciting programme features 116 games across the four divisions in a campaign which will mark the 27th year of Allianz’ partnership with the GAA as sponsor of the Allianz Leagues, making it one of the longest-running sponsorships in Irish sport. Email “'Whatever game is in front of us we have to go out and win - no matter what'”. Feedback on “'Whatever game is in front of us we have to go out and win - no matter what'”.